Eisenhower Memorial Commission – The bill provides no funding for the Eisenhower Memorial Commission, extends the authority to build on the present site, and requires that all construction funds be appropriated before construction begins. That the legislation would extend authority to build the monument on the same site suggests that Congress may be gearing up to have the General Services Administration sponsor a new (and presumably fair) design competition to memorialize the nation’s 34th president and commander of allied forces in Europe during World War II. Congress had already given it several score of millions before shutting the spigot two years ago, so the Ike commission probably has enough money in its kitty to hang on, paying staff to write nasty press releases about people who oppose the Gehry design. The fact that the bill also says the commission cannot start building the memorial until the entire construction cost has been raised is another one of its thousand cuts, which are mounting up. What’s not mounting up is private funding. Not long ago the commission spent hundreds of thousands on fundraising – more than the amount raised! 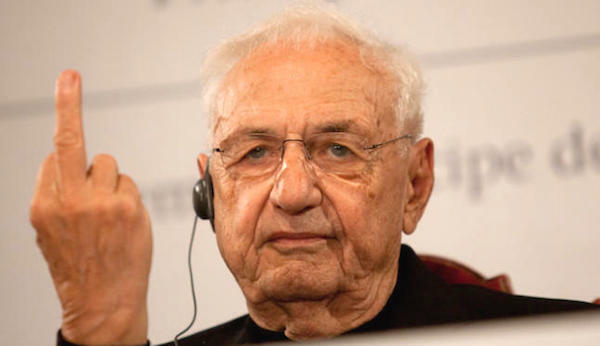 News of this legislation certainly should please all who want the Gehry design to go away. The Great Architect has already said he would disassociate himself from the project if, in an effort to compromise the design back into Congress’s good graces, its gargantuan steel “tapestries” are eliminated, as recently proposed by Rep. Darrell Issa, who has overseen several congressional investigations into the Gehry fiasco. Now, I don’t want to start beating a dead horse too soon, but the way to get a memorial to Ike built bestest and fastest is to take Gehry up on his offer. This entry was posted in Architects, Architecture, Art and design and tagged Appropriations, Congress, Eisenhower, Frank Gehry, Justin Shubow, Memorial, National Civic Art Society. Bookmark the permalink.